Size: 6.1" x 3.2" x 0.6"
This TI-30X IIS was manufactured by Nam Tai Electronics, Inc. for the consumer electronics retailer Best Buy. It was released for the Back-to-School 2008 campaign together with a purple and a blue TI-84 Plus Silver Edition. Wal-Mart, the largest grocery retailer in the United States, introduced in 2008 an identical TI-30X IIS together with a translucent TI-84 Plus, a red TI-84 Plus Silver Edition and a beautiful blue TI-84 Plus Silver Edition. Disassembling this model of the TI-30X IIS manufactured April 2008 reveals a well known internal construction. We discovered already in 2004 with Inventec Shanghai, Kinpo Electronics, Inc. and Nam Tai Electronics, Inc. three different contract manufacturers for the TI-30X IIS. Comparing two calculators with datecodes N-0204 and N-0408 yields no significant differences. Please remember the purple TI-30X IIS introduced already in 2003 by U.S. retailer Wal-Mart. 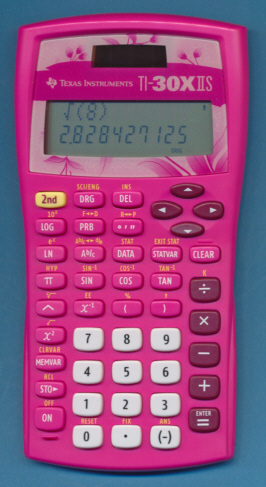 Wal-Mart continued to offer this pink TI-30X IIS - with an even lower sales price of $12.00 - for the Back-to-School 2009 campaign, while Best Buy dropped the product. Don't miss the dark-blue TI-30X IIS sold in 2009 by Staples, Wal-Mart and Meijer. If you have additions to the above article please email: joerg@datamath.org. © Joerg Woerner, August 20, 2008. No reprints without written permission.